Click on the green Create button at the top middle of your browser, and from the drop-down menu choose either Family. On the next screen, input the family's name. Your system will suggest possible matches, to help avoid duplicates. If you think one of the the suggested matches is the family you want to create, hover over their name and it will give you extra details to help confirm if it is them or not. If it is them, simply select their name and it will take you to their page, otherwise continue creating the new family! Fill out the new family's information. At the bottom of the page, you can Enroll your new family in one or more Programs and Assign staff members. 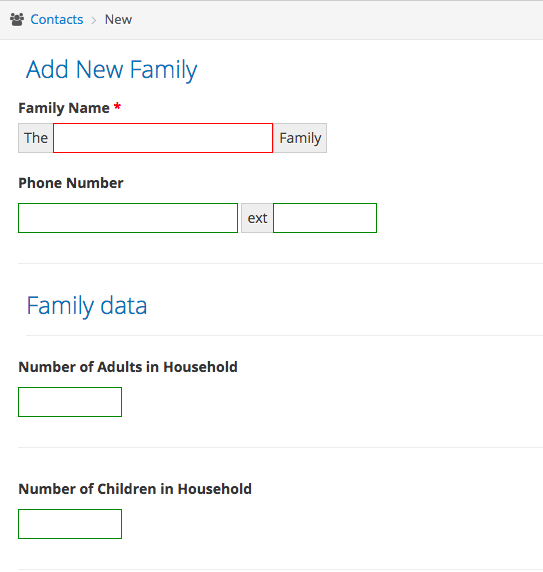 If the program(s) you are enrolling the family into have Program Categories you will be prompted to select those as well. When you’re ready to save, click the blue Save button at the bottom. If you want to discard the family, click cancel. After Saving, the family's dashboard will appear and your family is ready to go!